A major challenge towards large scale deployment of autonomous mobile robots is to program them with formal guarantees and high assurance of correct operation. To this end, we present a framework for building safe robots. Our approach for validating the end-to-end correctness of robotics system consists of two parts: (1) a high-level programming language for implementing and systematically testing the reactive robotics software via model checking; (2) a signal temporal logic (STL) based online monitoring system to ensure that the assumptions about the low-level controllers (discrete models) used during model checking hold at runtime. 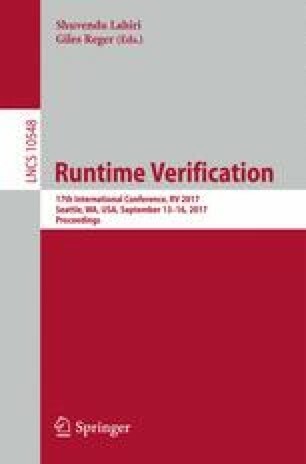 Combining model checking with runtime verification helps us bridge the gap between software verification (discrete) that makes assumptions about the low-level controllers and the physical world, and the actual execution of the software on a real robotic platform in the physical world. To demonstrate the efficacy of our approach, we build a safe adaptive surveillance system and present software-in-the-loop simulations of the application. This work is funded in part by the DARPA BRASS program under agreement number FA8750-16-C-0043, NSF grants CNS-1646208 and CCF-1139138, and by TerraSwarm, one of six centers of STARnet, a Semiconductor Research Corporation program sponsored by MARCO and DARPA.